Of all brochure design projects, designing a coffee table book is the most interesting. Especially if it is for the World’s largest car dealership! Think of a car dealership and what do you think of? Whatever it is, it is nothing compared to what you find upon a visit to Cargiant. Nothing at all! Based in Willesden, London, Cargiant is the World’s largest car dealership. And, from the air, this is clear to see. We know because we were up there in a helicopter flying around the site for half an hour as our aerial photographer was busy clicking away for a very interesting project. Located on a 40 acre site with up to 7000 cars in stock and with over 600 employees dedicated to making your car purchase be as painless as possible, Cargiant is literally a record breaker. To prove this, they have the Guinness World Record Holder certificate in pride of place at their office It confirms they are the ‘largest single site car dealership in the world’. The Cargiant brand is synonymous with size, choice, quality and best value. An ongoing, strategic TV, radio and web advertising campaign has led to over 5 million website hits per month and over 40,000 cars sold each year. Cargiant is a great success story but this has not happened overnight. It has taken over 35 years to build up to what it is now. Back in 1977, the company was set up in Chiswick, West London. That first year saw a handful of cars sold each week but the company’s aims were much bigger. Much bigger indeed. 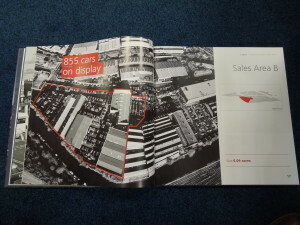 Moving to a 2 acre site on Hythe Road, Willesden in 1981, sales reached 150 cars per week and the vision was taking shape. 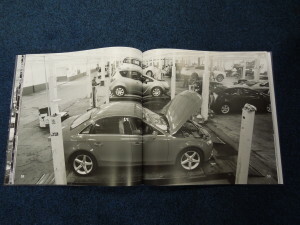 Initially 12 employees managed every operation of the company and they set the foundations for the business model ‘to sell as many as possible quality cars at the best possible price’. The transaction from small used car retailer to Cargiant was well and truly underway. Fast forward to the present day. Over 40,000 cars are now sold each year from that one site and investment into the infrastructure has never ceased. Most recently a state-of-the-art paint shop and the new £1m Area A sales office has been built. The future for Cargiant looks just as challenging as their past. The new High Speed Rail (HS2 link) is set to run through or terminate in this part of London and as such the masterplanning for redevelopment of the area may lead to a compulsory purchase order being issued for the Cargiant site. This has led to Design Inc being approached and invited to tender for designing a coffee table book that would serve to showcase the staggering size of the business in all its glory. Needless to say Design Inc won that tender and the work ensued. The purpose of the book was to creatively demonstrate extent of the Cargiant site and operations as well as its importance and impact on the local area and economy. This area of London is certainly no wasteland, as some influential local governmental figures had reported. Our job was to completely dispel that myth. Designing a coffee table book of this quality and scope is no mean feat under any circumstances. Quality, creativity and attention to detail are paramount. And, to blow our own trumpet, that is one of reasons we won this tender. Add to that an almost impossible deadline and we have all the ingredients for an exciting project. a) The proximity of the Cargiant site to Heathrow’s flight path affected the height and time we could fly. b) The weather during January was stuck on one setting: heavy rain! c) The size of the site and the height restrictions meant we needed a extremely sharp image from a long distance and oblique angle. A shot-list was drawn up and agreed with the client for the aerial photography. We now had a full specification (locations, height, angles) of all the site buildings of which we would take images..
A helicopter was chosen over an unmanned drone or a fixed wing aircraft to provide a more stable platform for the photographer and greater control. Moreover, Heathrow Tower would ultimately be controlling the flight once near the target site and we knew they would be better disposed to the use of a helicopter so close to runway centre-lines. So, once we spotted a rare break in the weather and received air traffic control clearance, up we went. We couldn’t have asked for a better slot. It was bright, the air was clear and with the sun mainly low behind us it was the ideal situation for the aerial photoshoot. Images were shot on a 60Mb Hasselblad H3950 camera. Aerial photography undertaken, ground photography was our next task. It was determined that, due to size of the Cargiant operation we would require 4-5 full day sessions to capture the whole Cargiant site and its many buildings, both inside and out. 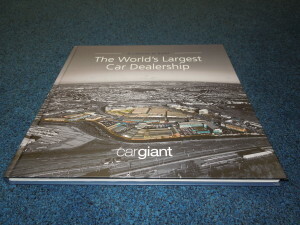 The ground photography focused on the extensive vehicle display areas, split by manufacturer and model types, the many workshops, administration buildings, showrooms, customer restaurants, car parks as well as the many other local industrial trading estates managed by the Cargiant operation. Due to the weather as well as the limited lighting at this time of year, we were aware that only limited time would be available for external shots and a plan was set up to maximise internal photography when external photography was impossible. Due to the size of the areas and buildings, some shots required additional height and this brought in added health and security issues. Various cherry- pickers and raised platforms were required as well as access to the roofs. Fortunately, our earlier recce enabled us to foresee these issues and set up adequate solutions and relevant permissions prior to the first day’s shooting. Furthermore, the site recce also enabled us to be able to plan and set up certain shots that required vehicles and equipment being moved into place as well as many items and equipment moved out of shot. Overall, over three thousand images were taken and passed over to the Design Inc creative team. At the same time, a working pagination for the book had been formulated and this too was handed to the creative team. 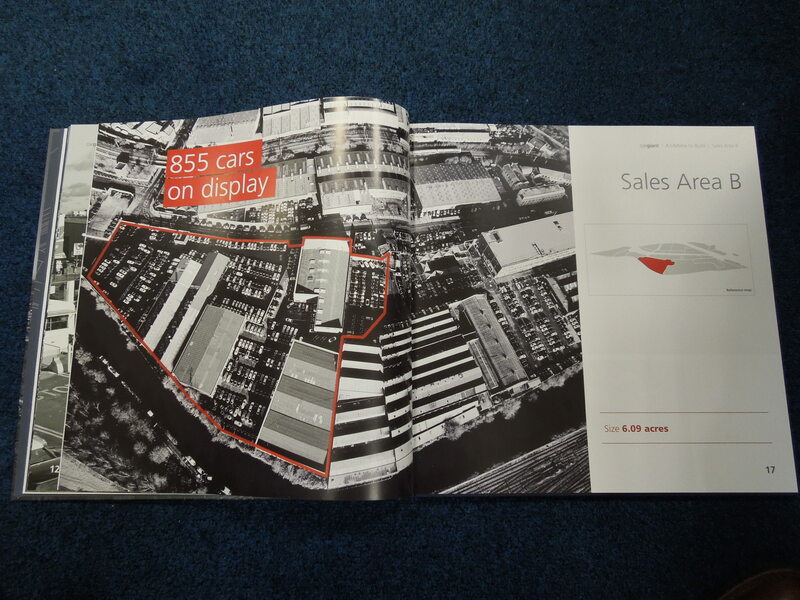 The pagination showed that the design of the coffee table book would need to be over 120 pages split into sections which served to promote each area of the Cargiant site. 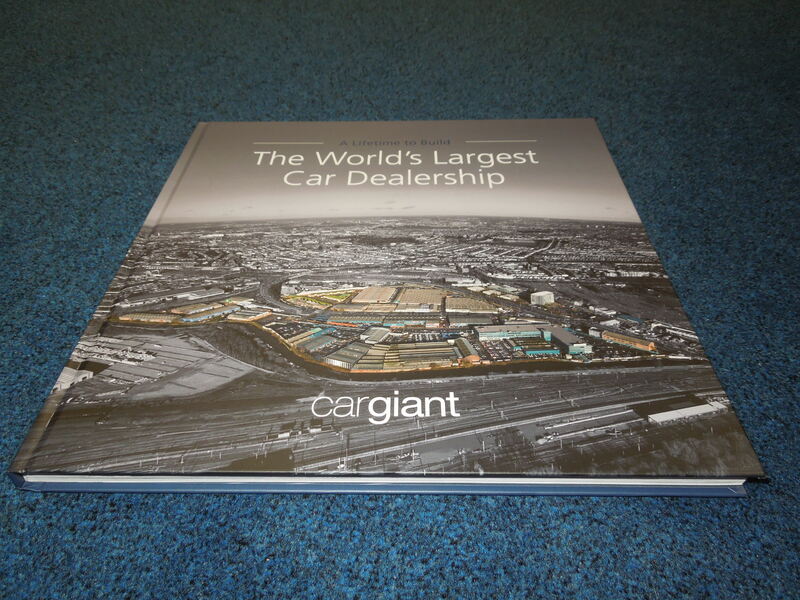 As the underlying creative brief was to show the size of the Cargiant operation, it was only right to design this book to a large format size. 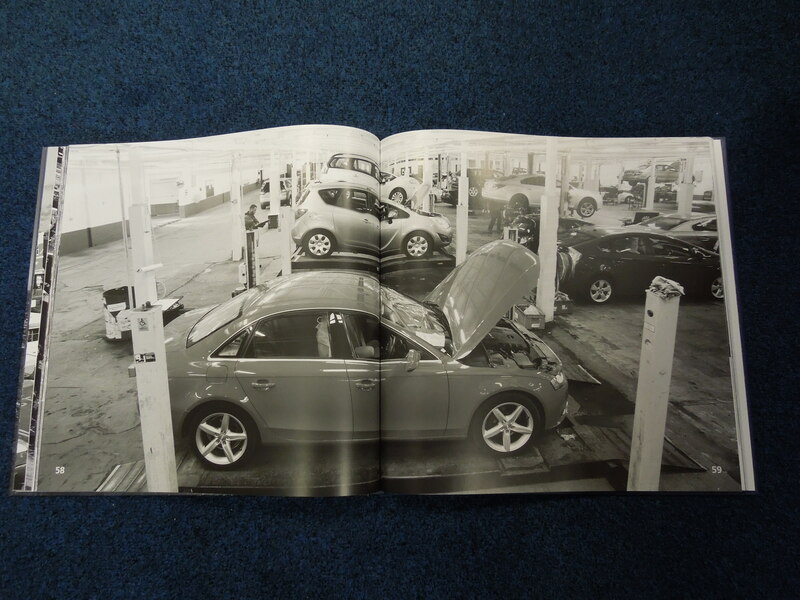 We opted for a square, 300mm by 300mm sized book that allowed a 2:1 ratio for spreads within. Ideal for large format aerial imagery. For each section of the book the underlying creative context was the same, namely a two page duotone aerial image of the area followed by a spread of black & white and colour external building shots. This was, in turn, followed by a spread of internal building images. All the selected photographs needed support: retouched, colour corrected, desaturated, enhanced, resized and generally tidied-up. Where possible, stunning panoramic images were also created by the ‘stitching’ together of two or more images. Finally, facts and figures for each area were added as appropriate. To cap it off, an aerial image of the whole site appeared on the front of the book. The site itself was created as the only colour area within a duotone, ‘curved earth’ landscape. Design Inc also managed the printing of the publication and it was crucial that the artwork and specifications were exact for lithographic printing. As a blank mock-up or dummy book had already been created earlier, the client had already approved size, proposed paper stocks and overall the quality we were aiming to achieve with the published books. The coffee table book would end up as 120 pages with hard-backed board cover and special end papers featuring the site map. Moreover, stitched and folded within the book was a throw-out poster measuring 900mm by 300mm. Content pages were printed onto 150gsm silk coated paper, end papers on 120gsm uncoated stock with the covers printed onto the 150gsm silk over 2mm board. This created a 14mm spine. Print time was booked-in weeks in advance and with every other aspect of this project working to set deadlines, it was important that all files were supplied by a certain time and date. Miss the print deadline and we miss delivery date. It had to work perfectly. And it did. It is fair to say that the client had an impossibly tight deadline. The book was required for a key meeting, the date of which could not be moved. Overall, Design Inc had just six weeks to turn around this whole project. We are pleased to say that two days before the scheduled meeting, the books were all delivered to the client.